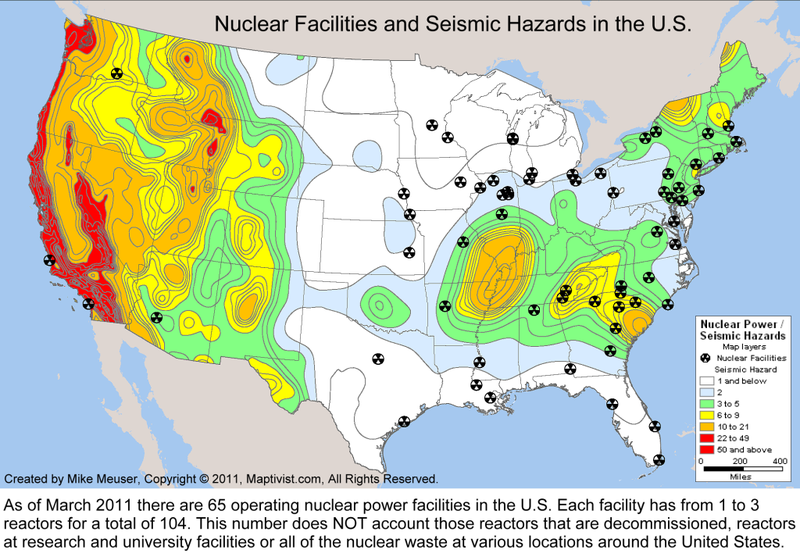 Nuclear accidents have happened and can happen at any nuclear site. Chernobyl, Three Mile Island, and Fukushima are all prime examples of nuclear mishaps. Even the most redundant of safety precautions can be compromised, and in the worst cases cause a nuclear meltdown. It is important to know your proximity to nuclear power plants and prevalent winds for your area as well, since nuclear fallout can easily travel hundreds of miles through the atmosphere. Nuclear accidents can also happen with nuclear warheads. The military has surprisingly mishandled quite a few warheads, and even lost some permanently! A nuclear accident would result in either a nuclear detonation or a radiation leak. The radiation leak accidents are more common, but the detonation accidents are much more severe and give less notice. Nuclear accidents have one type: severe. Whether it is a detonation or a radiation leak, a single nuclear accident likely has the potential to kill millions. Even if they do not historically claim large death tolls, it is merely due to the advanced notice we receive and the ability to evacuate. The radiation spilled is no less severe, and often taints the land making it unlivable for centuries to come. There have been narrow misses, such as Three Mile Island, that are still considered nuclear accidents without as much catastrophic destruction as you might expect. A single nuclear accident cannot cause TEOTWAWKI, although it can empty cities and displace people for hundreds of miles. If multiple accidents were to occur in close proximity and around the same time, society might have a difficult time recovering. This would be much more likely to occur as a result of an attack. A nuclear attack is the scenario you should be anticipating as the world changing event, rather than a nuclear accident. A nuclear accident is currently much more likely to occur than a nuclear attack, however. 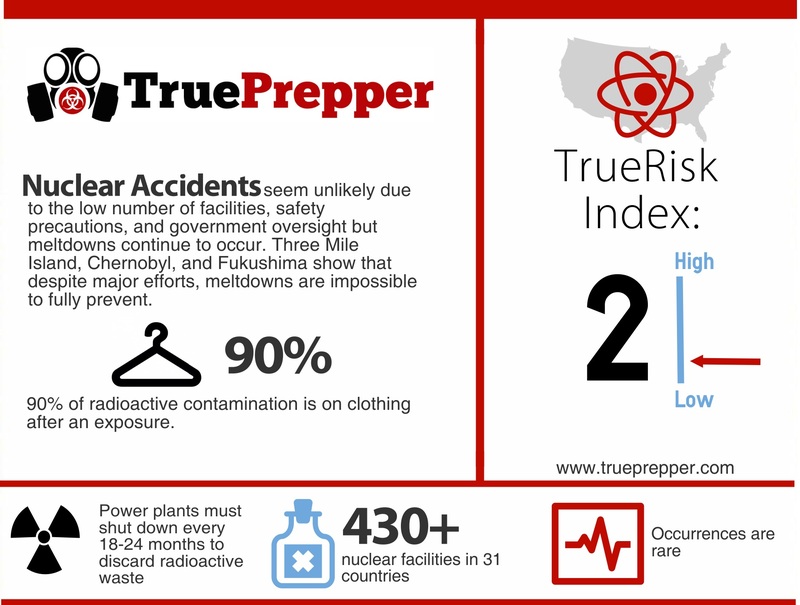 A nuclear accident registers on the TrueRisk index as a 2. This risk can be elevated based on your proximity to a nuclear reactor or nuclear weapon assets typically stored on US Air Force bases. It may seem odd at first, that nuclear accidents are higher risk than attacks. Although coordinated nuclear attacks would fracture our society to the core, nuclear accidents are simply more likely and still pose wide scale danger. It also seems odd to assume that, as humans, we are more likely to mess up and have an ‘accident’ than to intentionally nuke each other. History shows, even as recently as Fukushima, that that is simply the case. The calculated risk of a nuclear accident truly does outweigh the calculated risk of a nuclear attack due to the many nuclear accident occurrences that have already happened and will happen. Determining your risk requires a good deal of map checking. You will need to check your proximity to nuclear power plants and military bases. Assume that any military base with a protected runway could be transporting fissile material, especially Air Force bases. Once you have those marked on the map near your home, you need to check the prevailing winds for your area and for the bases and power plants. If you are downwind from either of these facilities, you are at a higher risk for a nuclear accident. Just because you are not downwind does not exclude you, as wind can decide to blow in different directions and the Air Force has lost several nuclear bombs in transport. No home is 100% safe from a nuclear accident (unless you live in a fallout shelter). The last thing you need to check for is earthquake seismic activity. If you live in an active area and live near a reactor, your risk is even more elevated. Check the map below for overlapping seismic and nuclear hazards. Getting prepared for a nuclear accident is much easier than it sounds. Determining your risk level, as shown above, is the tough part. If you are in a high risk area, a bug out bag may be your best bet. Nuclear accidents at least give a fair amount of warning before the catastrophe occurs, and evacuations are usually successful. If you have the means to prep with a bunker or fallout shelter, then that is even better. A stocked bunker will be needed for long periods of habitation, if you plan on using it. There will be advanced notice prior to an accidental nuclear detonation or radiation leak. This is mainly the case with nuclear power plants, since military assets are much more unpredictable and would likely not have any notice. The first wave would be the shockwave, which travels both outward and inward from the blast, similar to an ocean wave. Once that has passed, if you are in range of the fireball, you will likely not survive, but should attempt to find shelter behind a sturdy structure made out of concrete or cinder blocks. The survival rate of those exposed to blasts is not high, but attempting to survive is better than not. After the fireball, the fallout falls through the atmosphere and is carried downwind for hundreds of miles. This is historically the most deadly part of a nuclear explosion, due to the number of victims the fallout effects. You will want to protect your skin and your face from the radiation fallout with gas masks and radiation suits from your kits. Leaving the area should be your number one priority, and moving at a right angle from the direction of the accident is the quickest way. A radiation leak performs similarly to fallout, but is invisible, slower moving, and smaller in area. The same kit that keeps you safe for a nuclear explosion would keep you safe for a radiation leak. If you have been exposed to radiation, you will need to decontaminate yourself and change your clothing. You should seek medical attention where you may be administered tablets to help absorb the radiation you have been exposed to. If you are lucky to have survived a nuclear accident that affected your home, you will still need to permanently relocate. Radiation is usually covered up as it is very difficult to decontaminate from large areas. Even then, it will be centuries before the area returns to a habitable place once again.